Apprentice Rachel King is set to partner the Mark Newnham trained Lanciato when he makes his Group 1 debut in the $3m The Star Doncaster Mile (1600m) at Randwick on day one of The Championships on Saturday. Lanciato, above, is et to make his G1 debut in the 2018 Doncaster Mile at Randwick. Photo by Steve Hart. 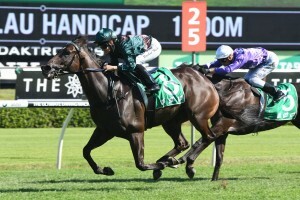 King has guided Lanciato up through the grades with three wins from his last three starts, including a last start victory in the Group 3 $150,000 Newcastle Newmarket Handicap (1400m) at Newcastle on March 9. Lanciato has had a barrier trial since for a second to the flying sprinter Redzel over a 1000m at Randwick on March 26 and Newnham was happy with the hit out even though he was beaten three lengths by The Everest winner. “Any time you’re racing or trialling against Redzel over 1000 metres he’s going to be too quick for you, but I was very happy the way he got into his work over the last 300. That’s what he was there to do,” Newnham told AAP. Lanciato’s Doncaster Mile weight was increased to 51kg, courtesy of a 1kg penalty for winning the Newcastle Newmarket Handicap, and the lightweight King gets the ride again on Saturday. “She rides the weight easily and he trusts her,” Newnham said. Lanciato kicked off his career in New Zealand with two wins and has found the winner’s stall on five occasions under the care of Newnham who has worked out that the five year old is best left alone in the early stages of his races before delivering a powerhouse finish which he demonstrated with his las t to first win in the Newcastle Newmarket Handicap. In early betting for the Doncaster Mile at Ladbrokes.com.au, Lanciato was rated a $21 chance while the James Cummings trainer three year old Kementari headed the market order at $4 ahead of the Canterbury Stakes winner Happy Clapper at $5.50 and the Rosehill Guineas winner D’Argento at $7. Early betting for the 2018 Doncaster Mile at Ladbrokes.com.au: $4 Kementari, $5.50 Happy Clapper, $7 D’Argento, $8 Humidor, $14 Tom Melbourne, $16 Comin’ Through, Crack Me Up, $21 Lanciato,, $26 Arbeitsam, Endless Drama, Tosen Stardom, $31 Alizee, Invincible Gem, Poetic Dream, Prized Icon, $51 Admire Winner, Clearly Innocent, Cliff’s Edge, Egg Tart, Foxplay, Heavens Above, Interlocuter, Radipole, Satono Rasen, Sovereign Nation, Stampede, Theanswermyfriend, Villermont, $61 or better the rest.